You are looking for an inspiring Design Thinking workshop inhouse. We offer tailored Design Thinking training for corporations all over Europe. Just get in touch! Design Thinking is a systematic innovation process that serves to identify and eliminate the real pain points of customers. The process enables companies to develop solutions for real user needs and quickly test whether these solutions generate real value. With our Design Thinking Workshop your team learns to think creatively about products and services from a customer perspective. The workshop consists of approximately 20 fast and entertaining activities that lead participants from problem identification to testing a prototype solution. Starting with a concrete, practical question (i.e. how can we improve customer onbording) your team will go through the 5 phases of the Design Thinking process, directly applying the most important techniques and tools of the Design Thinking Method. All results of the workshop will be documented in the form of a photo protocol and included in a comprehensive presentation. With these documents as orientation and reference, the participants can carry out Design Thinking Workshops on their own any time after the training. At the beginning of the workshop, we will briefly show how and why Design Thinking has become one of the most popular innovation methods of our time. We will then present the Design Challenge agreed on with you for the workshop. Facts: Who uses what, when, why, how and where? Insights: What are the pain points, what creates pleasure? As soon as we have gained insights from the conversations, we can prioritize the identified pain points. For this purpose we create User Journey Maps with emotional levels. We then define what the new product or service should achieve and for whom exactly (which personas) the solution should be developed. Rarely is the first idea the best idea. Design Thinking encourages your team to explore options and build on the ideas of other team members. Combined, this creates a better overall solution than if everyone was trying to find solutions on their own. The idea phase takes many forms, but is essentially based on several moderated brainstorming activities with specific questions. The idea phase ends with the decision for a concrete solution. In the next phase, a simple prototype is developed for the idea the team decides on. Prototypes are created quickly and easily on paper, in PowerPoint or with Lego Serious Play and serve primarily as a communication tool. This enables us to receive high-quality feedback for our solutions. Based on the feedback on our prototype, we understand what changes we need to make bevor the product is ready for further implementation. 1-day Design Thinking Workshop at your location in Vienna, including workshop material for up to 15 participants, follow-up in the form of a photo protocol and extensive documentation for the application of Design Thinking process. 2-day Design Thinking Workshop at your location in Vienna, including workshop material for up to 15 participants, follow-up in the form of a photo protocol and extensive documentation for the application of Design Thinking process. INNOMINDS is an innovation consultancy with a comprehensive network of experts. We help organizations to become more agile and to master change. Our customers include leading companies such as Lufthansa and organizations in the public sector, such as the business development agency of the cities of Berlin. 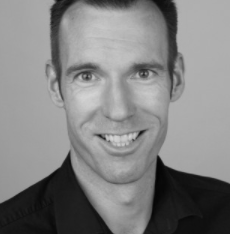 Jörn Steinz (MBA), born in 1975, is used to developing new solutions. During his 10 years with Accenture, XING and the Freenet Group, he led a variety of product and service development projects. For example, he successfully used the Design Thinking method at the technology retailer Gravis to develop innovative service offerings complementary to the sale of hardware products. As founder of the innovation agency INNOMINDS, Mr. Steinz has been conducting business training with a focus on building creative competencies since 2015. Mr. Steinz studied Business Administration in Aachen and Coventry and is a graduate of the EADA Business School in Barcelona. The innovation method of Design Thinking is rightly on everyone’s lips. Design thinking is essentially based on placing the user / customer at the centre of action (“customer centricity”) and enables the innovation process in companys to be structured. Design Thinking is not limited to the development and innovation of products or services, but can generally be used to analyze problems and to derive innovative solutions. This makes the method suitable for both external and internal applications. In addition to sound theoretical knowledge, our trainers have extensive practical experience from numerous Design Thinking projects and develop the Design Thinking method in the context of other agile methods (e.g. Google Sprint, Lean Startup, Scrum). Our Design Thinking seminar is based on the 5-step Design Thinking process (Understand and Observe, Point-of-View, Ideate, Prototype, Test). In this interactive workshop you will learn the method and its individual process steps. No previous knowledge of Design Thinking is required for the Design Thinking Workshop. GET YOUR CORPORATE DESIGN THINKING WORKSHOP NOW! We offer our seminars throughout the European region. You decide on the topic, the venue and the date of your choice.